During two August weeks, denim designer Maris Carrington and coastal architect Jason Barlow prepare for their much-anticipated wedding. Guests arrive early, turning keys in charming cottage doors to begin their New England summer escape. The wedding is a reason for old friends to gather again; to meet in their shabby beach hangout and get the jukebox cranking; to walk that weathered boardwalk beneath a starry sky; to breathe the sweet salt air. “Cures what ails you,” one of the friends, Neil, always said long before his life was sadly claimed. But his legacy was not. When Maris discovers Neil’s long-lost journal, its passages reveal a heartbreaking secret. Can truths be found within its timeworn pages? Can this leather-bound journal unite the friends as their lives begin to fray? A bittersweet family reunion, a surprising encounter from a devastating accident, a shocking confession leaving one marriage shattered–all will test the once close-knit circle. Suddenly this safe haven on the tranquil Connecticut shoreline churns with emotional turmoil, threatening even the beach wedding just days before it is to happen. Yet like a silver cap on a breaking wave, love and friendship wash ashore with hope, ever shimmering, in The Denim Blue Sea. 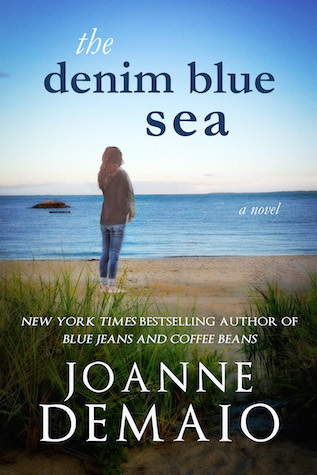 Joanne DeMaio has another 5 star book in The Denim Blue Sea! This is her fifth book, and I’ve loved every one of them. This book takes place at the beach and has a beautiful cover. Anyone who knows me knows that my favorite place to be is at the beach, so this book was very comforting for me to read. There were parts in the book that were sad, but overall it was a feel good read that would be perfect for reading at the beach. I always love catching up with characters that I loved in previous books, and we see a few of the characters like Maris and Jason form True Blend in this book, as well as a few others from her other books. This book is full of wonderful relationships and friends that are there for you no matter what they’re dealing with in their personal lives. Along with the friendships, there is also secrets, love, revelations and lots of happy times as well as sad times. There’s a lot going on, but it’s very easy to follow. So many emotions are within this book.The words draw you in your mind to Stoney Point and there you’ll stay, at the beach, among friends. I recommend this book, as well as DeMaio’s other books 100% and can’t wait for her next one. I’ve loved all of her books and this in on my wish list. Glad to see you recommend it! Vicki, I have read and enjoyed earlier books by this author. I will keep this one in mind. Wonderful review! I’m glad you enjoyed it. I haven’t read any of her books but this one looks like a good book for relaxed reading this summer! The title is clever too! I haven’t read any of DeMaio’s books before but this sounds lovely! I’ll definitely have to add the author and this book to my TBR. Great review! I haven’t read any of her books either but you have me sold with this review. I have other books by this author on my Kindle and I want to add this one, too. They sound so good…now to make time to read them!